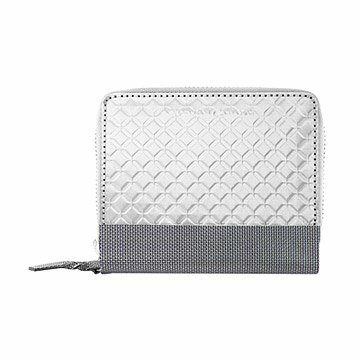 This woven stainless steel wallet is for women looking for something extraordinary. Used by astronauts, architects, and surgeons, the signature stainless steel material used in these wallets was included in the exhibition "Extreme Textiles" at The Cooper-Hewitt National Design Museum. That should tell you that this is no average wallet, but a reinterpretation for women looking for something extraordinary. It's also a great option for the security-conscious because it blocks unauthorized transmission from RFID-enabled credit cards and IDs, helping to keep your stuff safe from identity theft. With seven credit card slots, a bill compartment, and a hidden expandable pocket, it keeps everything organized in Space-Age style. Designed by Theo and Paul Stewart-Stand and Penelope Mahot; made in India.